Vice-Chancellor Professor Mamokgethi Phakeng exchanges ideas at a UCT Legacy Society event at UCT’s Graduate School of Business in Johannesburg on 24 November. 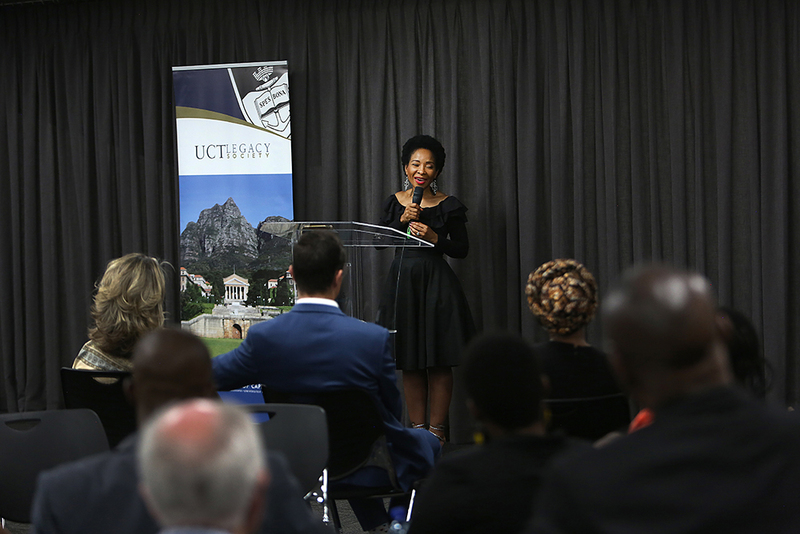 The UCT Legacy Society hosted Vice-Chancellor Professor Mamokgethi Phakeng in at the Graduate School of Business campus in Sandton, Johannesburg on 24 November, where the VC shared her vision for the university with members of the society and alumni. Phakeng explained that her vision for the university were based on three interwoven principles: excellence, transformation and sustainability. Excellence without transformation was not sustainable, she argued. “Transformation that does not recognise excellence has no integrity and it disrespects black people,” said Phakeng. Phakeng also urged delegates to play an active role in developments at the university. Delegates also met UCT Registrar Emeritus Hugh Amoore, who took over as president of the Legacy Society in March 2018. The UCT Legacy Society is a vehicle for alumni and members of the public to leave a bequest for UCT in their estates.